Affordable and accessible transportation is essential for businesses, especially manufacturers, to have ready access to get raw materials in and finished products out. Stephens County is perfectly situated for your business to access markets near and far. The growing I-85 corridor between Atlanta and Charlotte offers many advantages for businesses. Most Stephens County industrial sites are six to 15 miles to the interstate, making transport an ease in this affordable business location. The GA Hwy17 widening project will offer four-lane unobstructed delivery access between your company and I-85. 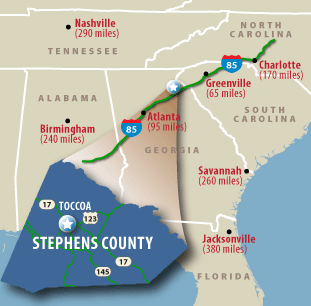 Stephens County is served by both the shortline Hartwell Railroad and a mainline of Norfolk Southern Railroad between Birmingham, AL, and Charlotte, NC. Additionally, Toccoa is the only city in the seven-county area of Northeast Georgia with an AMTRAK stop; the Stephens County Train Depot celebrated 30 years of AMTRAK’s Crescent Line service in 2009. With a runway length of 5,003 feet, R.G. LeTourneau Airfield is located two miles from Downtown Toccoa. It has two recently re-surfaced runways which can accommodate small jets. The Toccoa-Stephens County Airport Authority received a OneGeorgia EDGE Grant in December 2009 whichwas used to assist with construction of a 5,948 SF terminal facility at R.G LeTourneau Field. The airport is centrally located near the Georgia and North/South Carolina borders and serves as a gateway to the Northeast Georgia Mountains. This Level II airport handles comparable traffic to other Level III airports (Cornelia, Blairsville) and is Georgia’s northernmost airport before entering mountainous terrain, serving as a hub for Blue Ridge and Smoky Mountain tourist traffic. Located just 63 miles from Toccoa on Interstate 85, the Greenville-Spartanburg International Airport serves the region by offering flights to locations across the U.S. Located 91 miles from Toccoa, Hartsfield-Jackson Atlanta International Airport is the world’s busiest airport, serving as a valuable hub connecting various cities and countries around the globe. Georgia and South Carolina have accessible port facilities offering first rate services to and from locations worldwide. The closest ports to Toccoa are the inland Port of Columbus (204 miles), and the Port of Savannah (207 miles) and Port of Charleston (277 miles) on the Atlantic coast. The Port of Savannah is located on the Atlantic Ocean in Georgia and specializes in the handling of container, reefer, breakbulk and RoRo cargoes. The Port has two terminals, Garden City Terminal and Ocean Terminal. Garden City Terminal is the 4th largest container port in the U.S. Both terminals are served by Norfolk Southern Railroad and Interstates 16 & 95. The Port of Charleston is located on the Atlantic Ocean in South Carolina. The Port’s five terminals have the deepest channels on the South Atlantic coast, routinely handling post-Panamax ships and vessels drawing up to 47 feet of water. The port is served by Norfolk Southern Railroad and is accessible by Interstate 26, which links directly to Interstate 85. The Port of Columbus is located in Georgia on the Chattahoochee River with access to the U.S. Gulf via the Tri-Rivers System. The facility is equipped to handle liquid bulk cargoes via barge traffic. The port is served by Norfolk Southern Railroad and is also accessible via Interstate 85.